The above drawing is the frontispiece to Triumph-Wagen Antimonii, shown at the left. 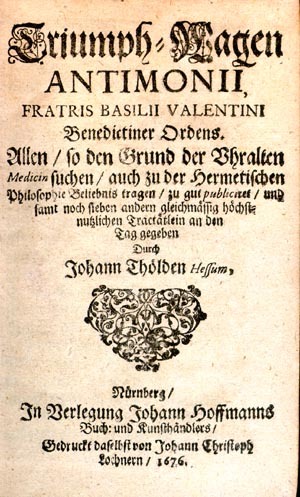 The book was published in Nurnberg in 1676 and contains treatises by several famous alchemists, including the Benedictine alchemist Basil Valentine, who wrote the featured selection. The engraving shows Mercury, Antimony, and other archetypal powers parading through the countryside in a chariot while an angel looks on from above. The word “triumphal” refers not to the conquering of anything but rather to an ancient pagan procession in which people dressed up in costumes depicting the archetypal forces in nature were carried through the streets in a chariot. For many alchemists, especially Isaac Newton, the metal Antimony became a more potent form of Mercury with which to work transformation. They were fascinated by a property of Antimony to form a cyrstalline star (the Star Regulus) under certain conditions. For alchemists, of course, that symbolized the Quintessence of matter.